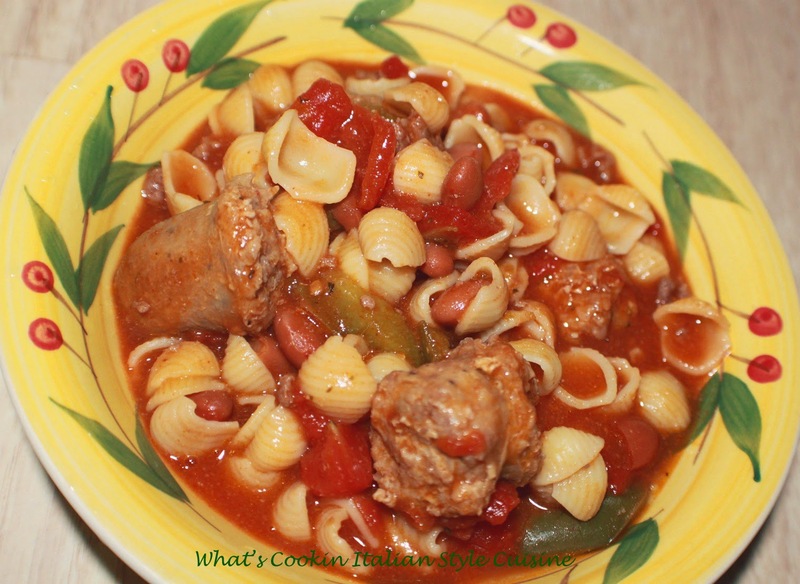 I love a hearty dish of Italian Sausage Chili and this is one comforting dish to make for your family. 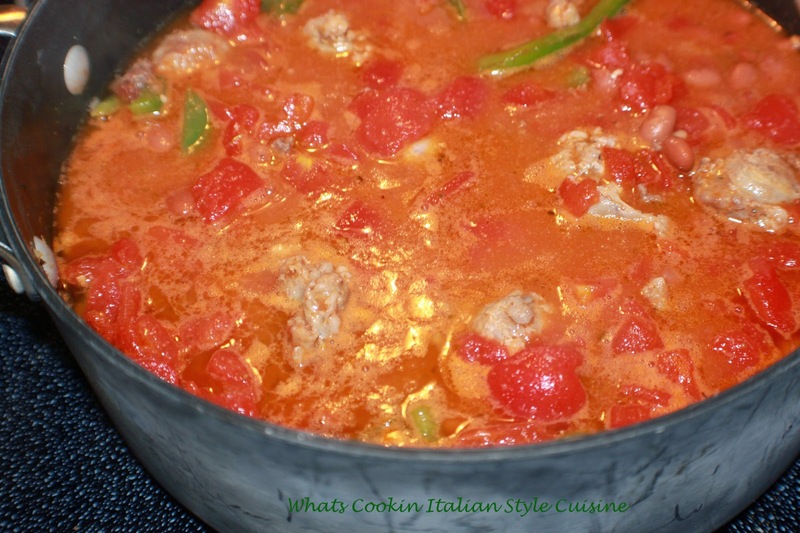 This Italian Sausage Chili, is loaded with crushed meatballs and Italian sausage. The sauce is slow cooked. Pasta is cooked separately and mixed in this delightful dish after that slow simmered sauce with beans, then it's completed! This is one of dad's favorite dishes, when I was growing up. Actually mom would make this during the week on a Thursday, if there was sausage left from Sunday sauce and macaroni day. We usually had alot left over from Sunday's big meal. Mom made her own sausage which made the Traditional Sunday Sauce very rich and delicious with pork fat, plus it added a little heat from the sausage which we all love spicy! 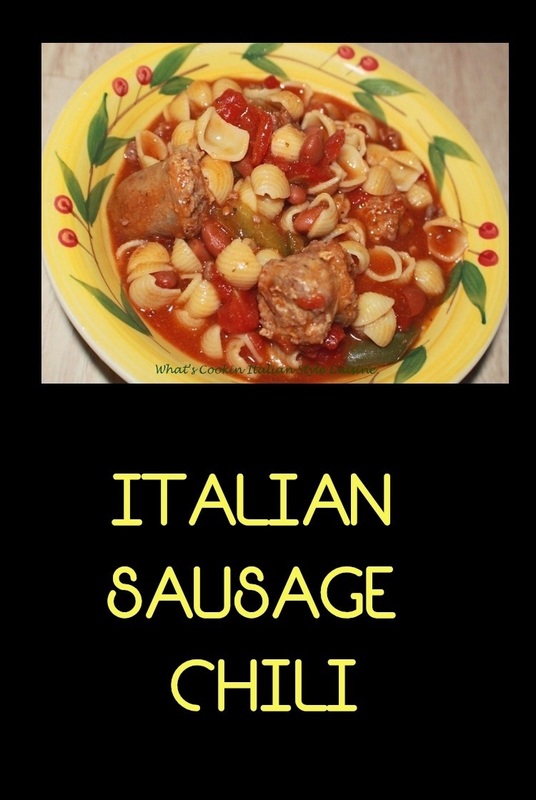 I used to love the sausage with baby shells and sometimes she would even throw in a can of peas or chickpeas! It always amazed me how she repurposed our leftovers into a meal that taste like she just made it fresh that day! In a large saucepan add 1/4 cup olive oil saute the meats with the peppers adding the garlic to cook last when the meat is almost cooked. Pour in the tomatoes, tomato sauce, wine and stir. Add the beans, salt, pepper, granulated garlic and cayenne if using. Simmer around 1 hour or until it thickens into a nice hearty sauce. Boil your favorite pasta to package instructions. Drain pasta and place into the pot of sauce before serving. Ladle into bowls and sprinkle cheese on top. I haven't added sausage to my chili in years! Time to shake things up with your Italian version. It looks wonderful!